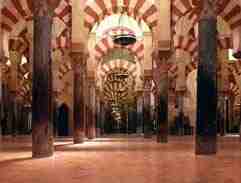 In 1933, Iqbal visited Spain and also went to see the Mosque of Cordoba. It was not an ordinary sightseeing trip by a tourist interested in ancient monuments but a pilgrimage to an outstanding symbol of faith by a faithful Believer and a warm-hearted poet. It was a pilgrimage of love and loyalty by a celebrated Muslim to pay homage to the spiritual legacy of Abdul Rahman el-Dakhil and his companions. Iqbal was greatly moved by the magnificence and solemnity of the Mosque and the deep emotional responses its awe-inspiring sight evoked in him found expression in the immortal poem called Masjid-i-Qartaba (The Mosque of Cordoba). Iqbal saw it as a cultural landmark of Islam and in its architecture and engravings he saw a moving portrait of the Believer's moral excellence and aesthetic refinement as well his high-mindedness, sincerity, piety and devotion. The Mosque reminded Iqbal of its builders and their keen appreciation of artistic beauty, and of the noble ideas and appreciation, call and message, they upheld in life and propagated in the world. Its tall, stately minarets revived the memory of the spellbinding Azan that once used to rise from them and which people heard every day at the beginning and the end of the stresses of life. The Azan is a symbol of the unity and solidarity of the Muslim Millet. The call it gives and the message it conveys may, indeed, be described as the National Anthem of Muslims and it is unique to their community. At one time the soul of the universe trembled and the foundations of the citadels of falsehood shook at the sound of it. 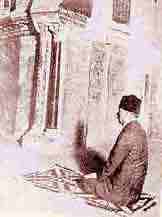 It was the Islamic Azan that announced the dawn of a new morning and dispelled the gloom that had enveloped the world in the 6th Century A.D.
Iqbal recalls the Divine message and the celestial guidance the Azans used to carry to the four corners of the world and the depth and intensity of their significance. The more he ponders over it the more is he convinced that the Millet which is endowed with this eternal call and lives according to this everlasting message is, also, imperishable. The beautiful yet poignant scene, the historical monument, the splendid Mosque (whose pulpit for centuries had remained deprived of sermons, courtyard and arches of genuflexion and minarets of Azan) touched every chord of his heart and reactivised the unhealed wounds. The ocean of his feelings was stirred and waves if faith and awareness, ardor and eagerness and music and melody, mingled with those of pain and disappointment, grief and anguish, began to rise in it. It was in these circumstances that the enthralling poem, Masjid-i-Qurtaba, was conceived, part of which was written in Cordova itself and the rest was completed during his stay in Spain. with it, all the wonders of art and architecture, historical buildings and ancient monuments, are heading towards ruin and destruction. But such constructions are an exception that are touched by the messianic hand of a man of God and a devoted Believer and shine with the radiance of his love. Chain of days and nights �fountain of life and of death! Of which the Being makes the robe of His Attributes! Where He of all possibility sounds the height and depth! Day and night in procession, testers of all this world. Find in death our reward and in dissolution our wage. One long current time, devoid of dawn and sunset? All in this world is of sand, all in this world is of sand! New be the pattern or old, its final halting-place is death. Love is the essence of life, death to which is forbidden. Other ages exist, ages which have no name. Love is an unripe wine, Love is a cup for the noble. Love is the brightness of life, Love is the fire of life. After this long prologue Iqbal turns to the Mosque and addresses these words to it: �O Mosque of Cordova! For thy existence and thy glory thou art indebted to love, to the tender passion that is immortal. In this way, thou, too, art eternal. �Philosophy, art and poetry, or any other form of literary or artistic activity, is shallow and insincere if it is not fed with the blood of the heart. It is no more that an empty structure of word and sound, paint and oil, or brick and stone, possessing neither life nor beauty nor freshness. Works of art, of whatever excellence they may be, cannoth endure without the intensity of inner passion, depth of love and profundity of earnestness. When a drop of love�s warm blood falls upon a piece of marble it turns it into a bearing heart and if even a man�s heart is destitute of love it is a slab of stone. Oh shrine of Cordova, thou owes; existence to love. Deathless in all its being, stranger to Past and Present. Out of the heart�s blood flow out warmth, music and mirth. From thee the pervasion of men�s hearts, from me the opening of men�s hearts. Handful of dust though it be, hemmed in the azure sky. What if prostration be the lot of the heavenly host? Warmth and depth of prostration they do not ever feel. Salat! And Durood fill my soul, Salat ad Darood are on my lips! Allah Hu, like a song, thrilling through every vein! On beholding this marvel of architecture, Iqbal is reminded of the real Muslim, the true Believer, whom only Islam can produce and, with it, the mighty Ummat also emerges on the surface of his mind from which the splendour of the Mosque is. Iqbal asserts that the Mosque of Cordova is a true symbol of the beliefs, thoughts and aspirations of the Muslim Millet, and just as the Muslim Millet is free from all the narrow and unnatural concepts of race and nationality it, too, represents marvelous synthesis of Arab and Persian cultures and typifies a remarkable supra-national fraternity. The Muslim is above territorial limitations. and his world is boundless. The beauty and warmth of his message is all-prevading. The Tigris and the Euphrates of Iraq, the Ganges and the Jumna of Indiam the Danube of Europe and the Nile of Egypt are but a wave in his shore-less sear. His achievements are unequalled in history. It was the Muslim Millet that gave the command to the outworn ages to depart and ushered in the modern world. Members of the Islamic Millet are the torch-bearers of compassion and fellow-feeling and true specimens of faith and fraternization. Best experienced with Internet Explorer 4 or above. Copyrights � 2000-2003 IqbalandSpain.com, All Rights Reserved.